Cut the pumpkin into thin rounds and then, cut rounds in half (reserve seeds). Toss the pumpkin and reserved seeds with 2 tablespoons olive oil, covering evenly, sprinkle with salt and place on a baking tray lined with baking paper. Roast the pumpkin and seeds in the oven for 20-25 minutes, until the pieces are very soft and the seeds are golden brown. While the pumpkin is roasting, toast hazelnuts (or your other nuts) in a dry pan over medium heat, until golden brown and then set aside. Combine honey and lime juice, 4 tablespoons olive oil and season to taste with salt and pepper. Transfer the roasted pumpkin and seeds to a bowl, pour over half of the dressing and toss gently. 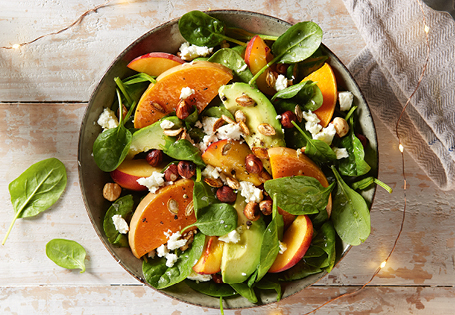 In another large bowl, gently toss peach wedges and baby spinach. Add the remaining half of the dressing and toss. Combine everything together on a platter or low serving bowl and garnish with the avocado slices, crumbled feta cheese and hazelnuts. Season with salt and pepper to taste. Serve immediately.